Consider the example of the remarkable engineering masterpiece known as the Curta calculator, which was presented as having arithmetic competence as an emergent property possessed by none of its components individually. Using the Curta to calculate the recursive formula X = R*X*(1-X) for R around 3.6 results in an essentially random (chaotic, technically) sequence of X's. The evolution of values may not be apparently deterministic in the sense that values follow some consistent pattern; but if you started with the same seed value you would get the same sequence time after time; thus the sequence is determined and hence Deterministic. True enough, and fair enough. Testing Determinism in this manner requires further exploration, since in practice as I pointed out to myself above, it does not seem to rule out Determinism. However, when examined carefully, this procedure does not actually constitute a fair test of Determinism, because the calculator cannot handle infinity decimal places. Chaos has the property that any infinitesimally insignificant variation in initial conditions or perturbation of subsequent states can produce an arbitrarily large divergence in outcomes at some future time less than infinity. To contradict Determinism, we would have to show that with initial conditions specified with even infinity decimal places, the outcome is still not inevitable. 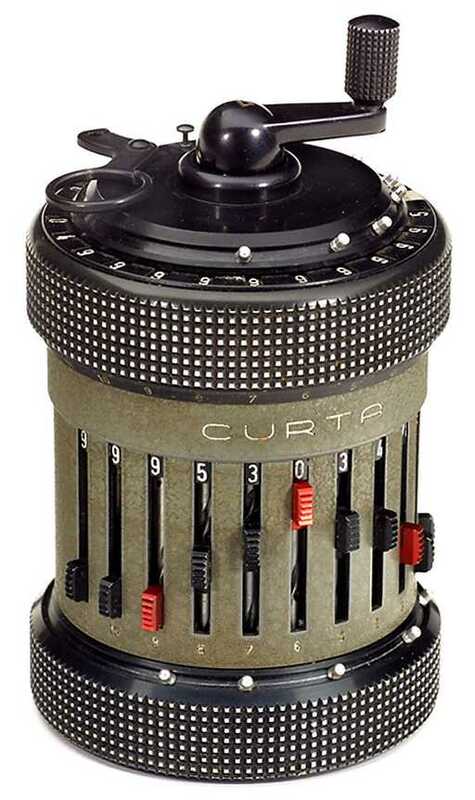 The Curta Type II (released in 1954) has 11 input digits, 8 counter digits, and 15 result digits. Alert Readers may notice that none of those numbers is infinity. The effect of this is what we call quantization of the results, or in popular parlance, "round-off error." This means that at every calculation, the result is forced artificially into one of a relatively few allowable values which are "rounded off" to the nearest decimal place retained by the mechanism. Therefore the result does not accurately reflect the actual theoretical result of the algorithm. The consequence of quantization is that at each step, the evolution of the process is reset to a fixed, known value. There just isn't ever enough time for the true chaotic nature of the algorithm to evolve if it keeps getting reset to one of a relatively small number of possible values. The only fair test of this form of non-determinism would be to see whether, with infinity decimal places, one result diverges from the result of previous experiments when the initial conditions are infinitely identical and infinite precision is retained at each step. Why do I think that would be the case? Purely mathematically it shouldn't happen in an idealized calculation. But an infinity-digit version of the Curta calculator (the actual Universe, effectually) is a thermodynamic object, and those digits are represented by components which are thermodynamic bodies subject to entropy. With infinity digits, the chances are good (100%, I'd say) that there will be random errors in the calculation eventually, making it impossible to obtain the same result twice in a physical process, thus making any given physical result not inevitable. The evolution of the universe is essentially a physical (analog) calculation of the of states of the universe as time progresses. While ultimately the states experience quantization similar to a 15-digit calculator's round-off error, this quantization is small enough to still allow plenty of uncertainty to creep in. In addition, quantum uncertainty (à la Heisenberg) introduces its own bit-errors into the evolution of states. Any limited calculator isn't a true representation of chaotic behaviour. Only unlimited decimal places can accurately carry out a chaotic calculation, and when you have that many decimal places you will also have a meaningful probability of digit (or bit) errors. These facts taken together essentially require that any two physical embodiments of a chaotic system must diverge from perfectly identical initial conditions and are thus in no way Deterministic. An example of a non-deterministic calculation being carried out is human genetics. The calculation is essentially, "let's combine two genomes and find out what happens, then combine that one with some other combination, and so on, generation after generation." To do this calculation perfectly with the same result in any two hypothetical "runs" of this experiment starting from identical initial genomes requires that there be no computational errors. Ever. In reality, every human has something like 20 or 30 random errors (known as "mutations") in their genome. Due to the thermodynamic nature of the mechanisms for encoding the genome and carrying out the replication, truly random, stochastic errors are inevitable and no result is ever "evitable" or assured, pre-determined, unavoidable, inescapable, or whatever the polar opposite of inevitable may be. Notice that in a crowded cell where particles are constantly interacting with each other and with electromagnetic fields, quantum indeterminism does not really enter into it because quantum states are constantly being collapsed and re-formed at every interaction. While others may, I do not think that randomness ultimately depends on quantum indeterminism, but that thermodynamic stochasticity is more than sufficient to provide for true in-principle and fundamental randomness in any physical system. Therefore, it is inevitable that you are a Mutant; but what kind of mutant was in no way predetermined by physics.